They say the test can provide results quickly and costs less than other testing methods. It can also be easily transported, giving health care workers a way to diagnose the virus almost anywhere in the world. The Zika outbreak started about a year ago when health officials in Brazil began reporting cases of people being infected. Now, nearly 60 countries and territories have reported Zika cases. Most of those infected are thought to have been bitten by mosquitoes. The insects can carry the Zika virus. Some countries also have reported cases that appear to have spread through sexual contact. 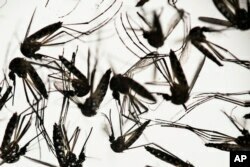 The World Health Organization says the world could face a severe public health crisis if the virus continues spreading. The WHO says scientists agree that Zika is the cause of two serious conditions: the nervous system disorder Guillain-Barre syndrome and the birth defect microcephaly. Babies with the birth defect have an unusually small head. Children with severe microcephaly usually do not live long. How is the new test better? The new test is the result of work by researchers at Harvard University in the United States. The researchers built upon earlier work on a method to test for Ebola virus. James Collins is a synthetic biologist. He led the team that created a way to test body fluids for Zika virus. The test is designed for blood, urine and saliva. But why develop a new method in the first place? The researchers explained their reasoning in a report in the journal Cell. In it they said that other test methods are limited. Most importantly, they say, these methods are not exact. The other tests look for antibodies in body fluids. But these antibodies are similar to other viruses such as Dengue. The researchers add that the other methods can also be costly. And they require special equipment that is not available in some areas. The new testing method uses paper cards about the size of a human hand. The cards contain freeze-dried biomolecular components. The freeze-dried part is important. The report says the components “remain stable at room temperature, allowing for easy storage and distribution in global settings.” In other words, they do not break down under normal conditions and can be stored almost anywhere. Only small amounts of the Zika virus can be found in blood. So, the researchers first make the blood sample appear larger through a process that causes the virus to reproduce. The larger sample is then put on the paper card. If Zika is present, the card changes color. Test results from an infected person can then be compared to another card to identify which form of the Zika virus is present. The new test can produce a result in as little as 30 minutes. An even faster result is possible, the researchers say, by placing the card in a special reader. The change in color can be easily recognized without special equipment. The researchers add that this method costs less than other tests for Zika. James Collins says that his team is currently looking for private and public money to make this test available to health workers around the world. There is no vaccine for Zika. The World Health Organization says developers in the U.S. and four other countries are working on 23 different projects to develop one. WHO officials expect some of those projects to be ready for testing by the end of the year. However, a fully-tested vaccine may not be available for several years. Until a vaccine is developed, efforts to stop the spread of Zika are directed at controlling the insects that carry it. The WHO says half of the world's population lives in areas where Zika-carrying mosquitoes live. Chris Hannas wrote this story for VOANews.com. Anna Matteo adapted if for Learning English. George Grow was the editor.